I never saw Joy Division play live. I didn’t realise who they were until my cousin gave me a tape in 1982 with Closer on one side (IMHO the best thing Joy Division recorded), and New Order’s 1981–1982 (or “Factus 8″) EP on the other (which, although it’s a compilation, is still IMHO the best thing New Order ever released). I still have the tape. I was sceptical when I heard that Hooky was going out on tour to play Joy Division tracks, that was until I heard the recording of “Unknown Pleasures, Live in Leeds, November 2012”. Not only is the production fantastic (in this age of bands churning out live recordings some of the mixes are pretty average), but I was blown away by the band and Hooky’s vocals. It’s not Joy Division, and it never will be, but I love this re-versioning of the back catalogue. I went to see the Light on their first round of New Order tours, and when they opened with a Joy Division set I thought that I had missed the chance of hearing the Joy Division albums in their entirety – and then this gig came up. 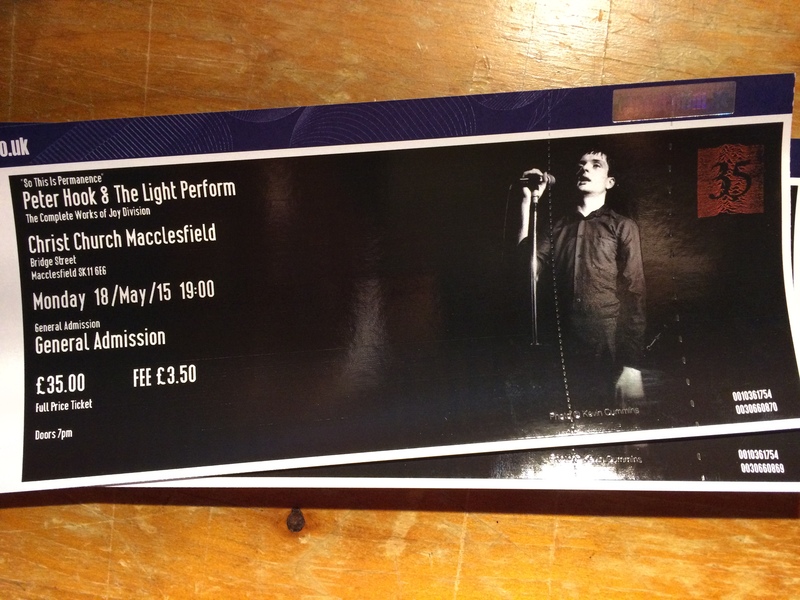 Christ Church in Macclesfield was chosen as the venue for this gig for several reasons – Ian Curtis grew up, and died, here, and Joy Division rehearsed close to the church. And the church is beautiful, and slightly opposing, sitting alone against a grey sky – a great choice of venue. A marquee was erected outside for bar and merchandise which was piping out the gig. I got chatting to one guy in the porta-loo queue who couldn’t get a ticket so he had just come down to hang out, sit in the marquee and soak up the atmosphere. The church holds about 470 people, and as the pews are fixed it meant that most people were able to get a few minutes sit down respite when the band took two five minute breaks (at the end of each LP). 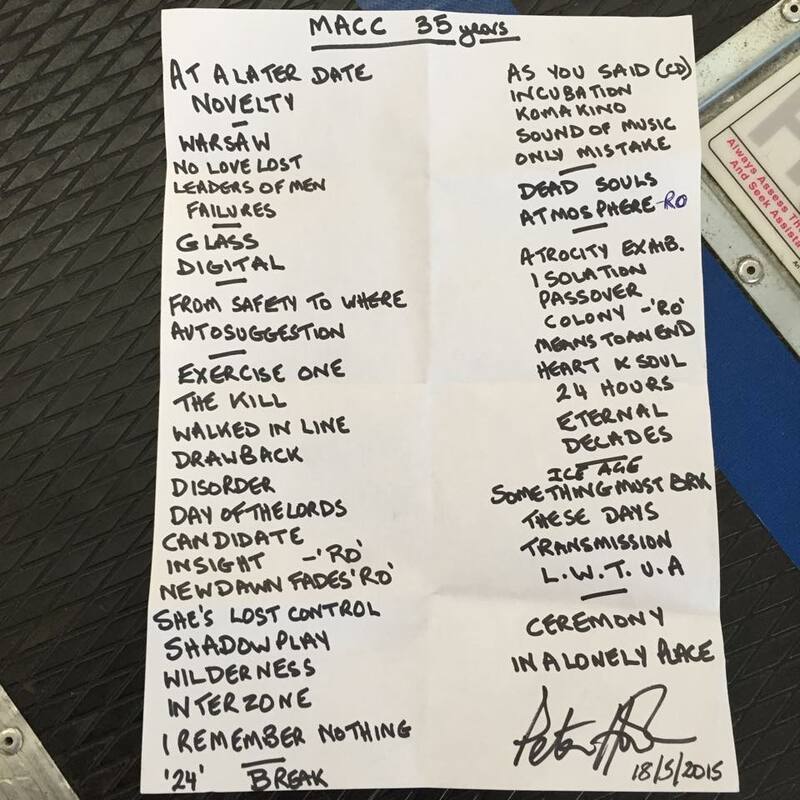 I was at the Cure’s Reflections gig at the Royal Albert Hall in November 2011 – 45 songs which lasted for three and a hours – and that felt like a long gig, but this gig flew by. Maybe it was the smaller crowd, the emotionally charged atmosphere, the occasion – or a mix of all three. The band played at the altar end of the church, with a giant stained-glass window as a backdrop (and the window was lit from outside). The light show was minimal, but an object lesson that, when the lighting engineer has imagination, you don’t need a huge lighting rig to put on a stunning show. In a way, the stripped back light show was perfect for the music – stripped back, punk-tinged rock. Exciting, urgent and energetic – the antithesis of the stadium-sized beast that New Order had become (apologies to any New Order fans, but IMHO they have become more radio-friendly-unit-shifter with each passing LP). The gig was epic. Everything Joy Division recorded, played in (more or less) chronological order, really appeals to my left-side brain. Two things screamed out at me after the gig. Firstly, that there is very little fat in Joy Division’s canon – almost every track has a hook or a lyric which elevates it from the post-punk mass. Can any other band lay down their first 47 tracks – all the b-sides, all the compilation LP track, warts and all – and demonstrate such consistency and such quality. I would say that Killing Joke could get close (KJ, What’s THIS for…! and Revelations, plus singles is a pretty awesome tracklist), but few others can. Secondly, is that hearing the songs in chronological order really highlights the evolution in Joy Division’s sound over their short span. The gig starts out with high-energy two/three minute punk work-outs, but when we arrive at Unknown Pleasures the sound is more stripped back, emptier and all the more powerful for it. By the time we get to Closer the sound is dense and dark and brooding. And then we get to the climax – Love Will Tear Us Apart and Ceremony and by now the sound is self-assured and epic in every sense of the word. Rowetta (of Happy Mondays’ fame) joined the band for four tracks – Insight, New Dawn Fades, Colony and Atmosphere – and it really worked well live, her powerful, soulful voice carried a raw edge which drove the songs further and harder. Joy Division are now recognised as one of the most important bands of all time. Truly seminal. The helped the transition from punk to post-punk, alternative, goth, new wave, and just about every other sub-culture to emerge from punk’s ashes. Ian Curtis could never have imagined how recognised and important the band would be 35 years later, and how his beautiful, poetic lyrics would be regarded. Is there a more important, more influential post-punk band? I don’t think so. And this makes what Peter Hook and the Light are doing all the more necessary. On paper this probably shouldn’t work; the bass player stepping forward to pick up vocal duties carrying the torch for Joy Division. But it does work, and it is vital and necessary. Thank you Peter – it was beautiful – and RIP Ian Curtis, you are truly missed. Love will tear us apart.